We hope you will come to visit us at Bibliomania, Espace Champerret, Paris 17e. Green, Julien. Le Visionnaire. 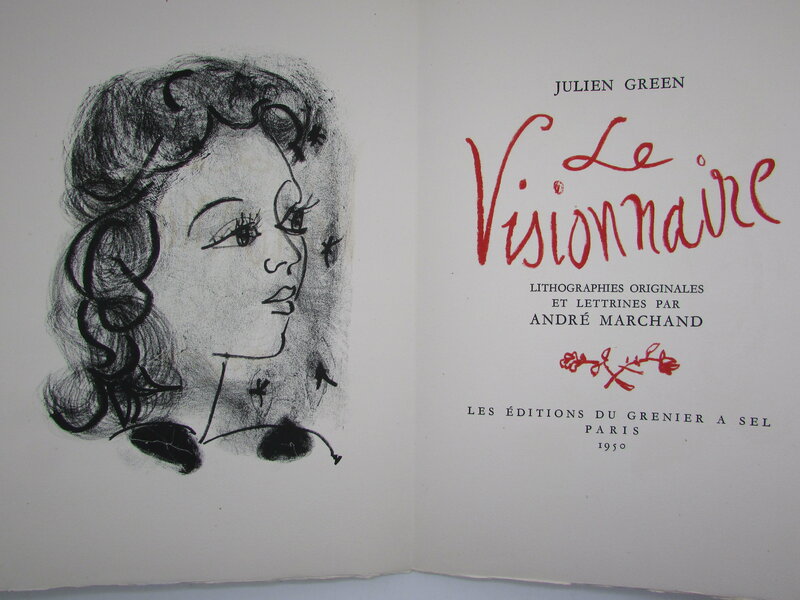 Lithographies originales et lettrines par André Marchand. Les éditions Grenier à Sel, Paris, 1950. Colin Paul. Tumulte Noir. Paris. Editions Anthese, 2011. 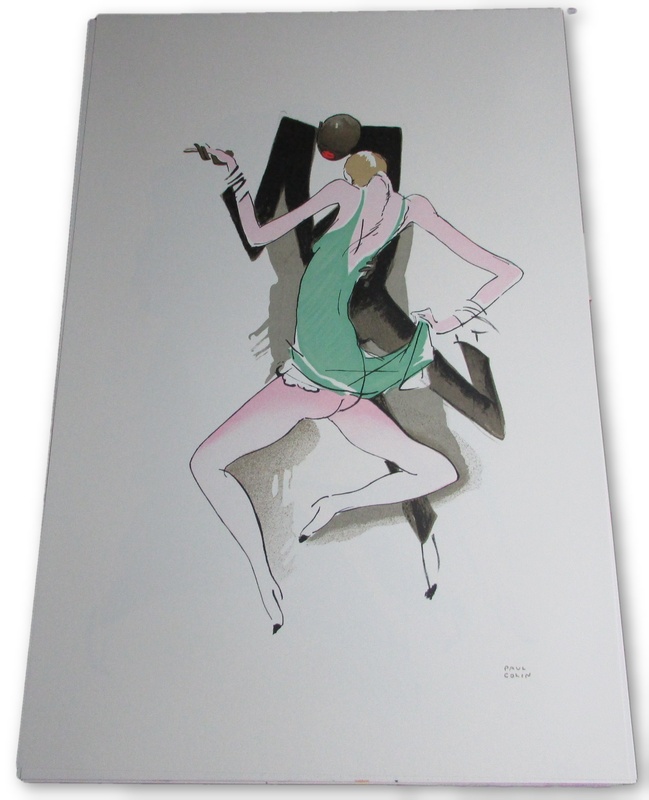 461/500 of this facsimile edition with 45 loose lithographs of the Jazz age. Dauphine. Les Albums Touristique de luxe. 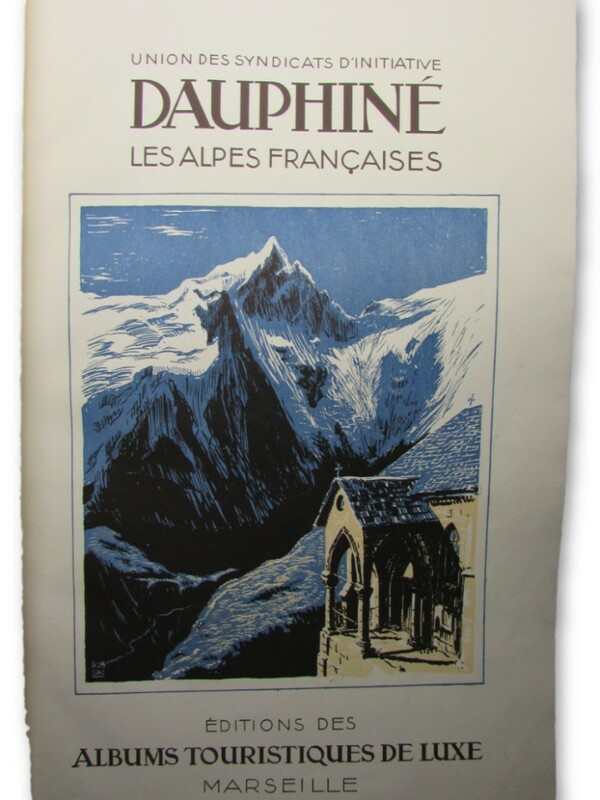 1935 6 coloured lithographic posters and accompanying text about regions of France. It is that time of year again, when Marcia and I must put all thoughts of road trips to one side, whilst we concentrate on preparing for the PBFA London Antiquarian Book Fair. As the name suggests, this is in London, has lots of antiquarian books and is put on by the PBFA. We manage the fair – so it keeps up pretty busy. This year, we have once more gathered a group of over 100 exhibitors who come to London to buy and sell beautiful books, maps and other works on paper. Dealers come from every part of the world to be part of the fair. This year at the Ibis Hotel, Lillie Road, we will welcome dealers from Canada – including Aquila books, and Voyager Press. From America, B & B Rare Books and D & D Galleries. (My new policy of only accepting Americans who use initials for their trading name seems to be bearing fruit). We also have friends old and new from Europe. Christian Haslinger and Antiquariaat Talke will both be presenting their usual impressive stands. We are also bringing along a contingent of Dutch booksellers this year, who we have met on our travels. Of course our core membership are the stalwarts of the PBFA. . We are very pleased that we span the generations of the organisation. Gerry and Glenda Mosdell, from the Junction bookshop are amongst the “founding fathers” of the Association, and are at the other end of the spectrum we are pleased to once again welcome the Bibliomaniacs, a group of booksellers from Papplewick school in Ascot, who proudly claim themselves as the youngest antiquarian booksellers in the world. Whatever your particular taste in books, you will find examples here. From the fine bindings of Temple Bookbinders to the Modern Firsts of Holybourne Books and Cheltenham Rare Books From the ancient manuscripts of Alastor and Modern First Editions to the Antarctic explorations of Kingsbridge Books and Meridian Books. Naturally there will be a variety of maps and prints from the likes of Michael Morris and several others. Chap walks in with the customary and highly cheerful “Good Morning, how are you today” that you just KNOW means he is going to try to sell you something. He comes up to the counter, and pulls out a month old and tatty copy of “Antiques Explorer” magazine. A free mag, that we distribute from the shop. “Would you be interested in buying this ?” he asks. after pointing out that a month old is not quite into the antiquarian and collectible scale of things, i dig out another 10 copies that we failed to hand out for free, and ask him if he would like to take these to add to his collection – that way he can make a real killing if he finds anyone stupid enough to buy them! Sadly he doesn’t want my copies. I guess i will have to recycle them as usual! I have just been on the end of an genuine rant by a genuine conspiracy theorist who genuinely believes that the world is secretly run by the New World Order. I didn’t think they really existed (The conspirasists that is – obviously the New World Order exist). He also believes that Jews run the NWO, that members of the House of Lords are practicing their marksmanship in Westminster to defend themselves against the revolution. etc etc etc. Here was here about 20 mins and paused for breath once. I just smiled sweetly and glazed over! Chap phones up to complain about a book order I have sent him. I look up the order, and assure him that the books have gone out to him with Royal Mail. “Oh I know that, I found them in my garden” it seems that the postie left them half in his letter box, and someone pulled them out,and threw them into the bushes. He wanted to know what I was going to do about it. I paused bleakly for a moment (wondering what all this had to do with me) and asked him how much damage there was to the books. I shall stop here ! At least he didn’t tell me they were blue !!!!! Not Just Me & Never a Cross Word. It isn’t only me !!! 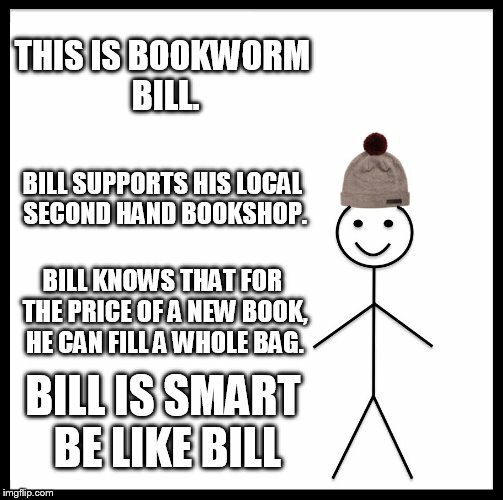 I was in Waterstones the other day (I know – just looking at recently published titles – honest Your Honour), when I overheard the following. So other bookshops do get them as well. Bloke walks into the shop and presents me with a slightly crumpled book of crossword puzzles, which he hopes I will purchase from him. In my nicest voice, I decline his generous offer (Well not so generous – he wants my cash). What do you say to that ? Come on – how can I reasonably respond ? (I stuck by my ‘no’ by the way). First Published September 5th 2005. We were very excited to visit the remarkable Deventer Boekenmarkt earlier this month. For the last 29 years, on the first Sunday of August the streets of the Dutch city of Deventer are literally filled (excuse the pun), with thousands of book stalls! The market stretches for over 6 kilometres, and showcases all kinds of books – from the secondhand book shops and antiquarian sellers, to self published novels and comic strip collections; people come from all over the Netherlands…and beyond. The market is always popular, very organised and full of surprises. This year was no exception, and we found ourselves (armed with reading glasses and a wheel along bag) among an excited throng of over 125,000 visitors. It took us a full 8 hours to do the market justice. Thoroughly recommended! For centuries, many printers and publishers have chosen Deventer as their base, and the city still houses many of national significance, alongside a wide variety of book shops and antiquarian book sellers. Among other goodies, we managed to pick up some nineteenth century political cartoons, a French hand coloured folio atlas, some beautiful children’s books and a very nice Japanese postcard album.